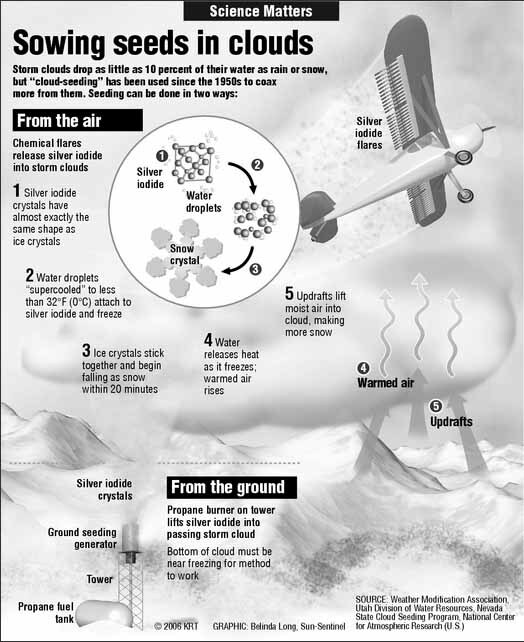 On Nov. 15 Wyoming started using small airplanes to flare silver iodide into snowstorms that roll into the Sierra Madre and Medicine Bow mountains, north of the Colorado-Wyoming border. North Dakota-based Weather Modification Inc. operates the planes. Since starting this fall, WMI has seeded clouds over southern Wyoming four times. Now, the Jackson County Water Conservancy District wants to expand the practice near the headwaters of the North Platte River in northern Colorado. The district is seeking a permit from the state’s Water Conservation Board to begin aerial seeding during winter storms. 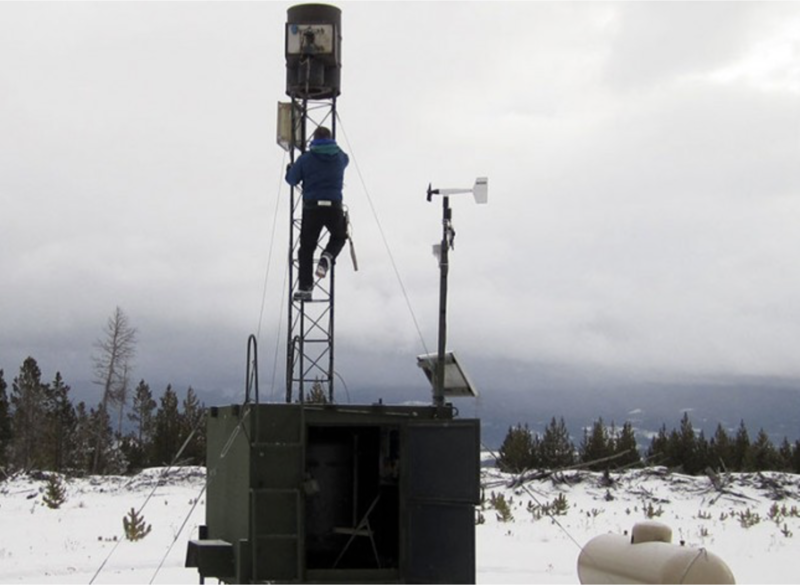 Recent studies have shown cloud seeding can marginally increase snowpack in theory. But a 2018 study from researchers at the University of Wyoming and the University of Colorado said big questions still remain regarding the practice’s effectiveness. If the state approves the permit, this would be Colorado’s first aerial cloud seeding program. Wyoming’s program costs the state roughly $425,000, with Cheyenne’s water utility contributing $45,000. The state also oversees cloud seeding towers in the Wind River mountain range, which are partially paid for by water agencies in Arizona, California and Nevada. 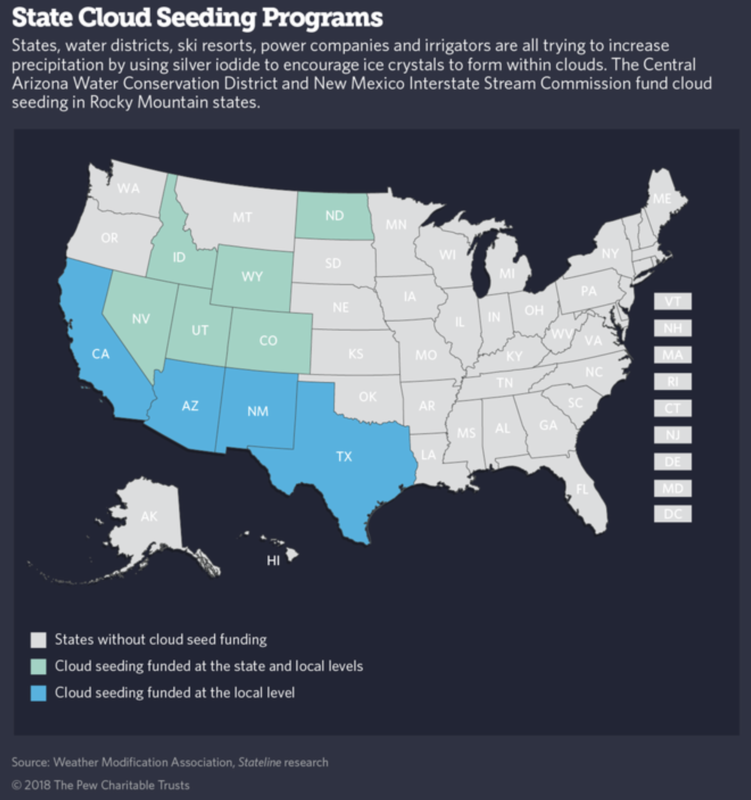 Some of Colorado’s cloud seeding operations receive funding from the same states, all in the Colorado River’s lower basin. Earlier this year, water managers in the seven basin states signed a new agreement to continue cloud seeding operations in the southern Rockies, allocating up to $2 million annually. The practice was included as a way to increase water supplies in Drought Contingency Plans being negotiated now, and recently approved by Colorado’s top water authority, the Colorado Water Conservation Board. Aerial seeding in northern Colorado could begin later this month. A University of Wyoming researcher contributed to a paper that demonstrated, for the first time, direct observation of cloud seeding — from the growth of the ice crystals through the processes that occur in the clouds to the eventual fallout of the ice crystals that become snow — and how the impacts could be quantified. The research, dubbed SNOWIE (Seeded and Natural Orographic Wintertime Clouds — the Idaho Experiment), took place Jan. 7-March 17, 2017, within and near the Payette Basin, located approximately 50 miles north of Boise, Idaho. The research was in concert with Boise-based Idaho Power Co., which provides a good share of its electrical power through hydroelectric dams. French credits modern technology, citing the use of ground-based radar, radar on UW’s King Air research aircraft and multiple passes of the mountain range near Boise with making the detailed cloud-seeding observations happen. Despite numerous experiments spanning several decades, no direct observation of this process existed before SNOWIE, he says. French is the lead author of a paper, titled “Precipitation Formation from Orographic Cloud Seeding,” which appears in the Jan. 22 (today’s) issue of the Proceedings of the National Academy of Sciences (PNAS), one of the world’s most prestigious multidisciplinary scientific journals, with coverage spanning the biological, physical and social sciences. Other contributors to the paper were from the University of Colorado-Boulder, University of Illinois at Urbana-Champaign, the National Center for Atmospheric Research (NCAR) and Idaho Power Co.
“SNOWIE was a great collaborative effort, and it shows the value of private, public and academic partnerships,” says NCAR scientist Sarah Tessendorf, a co-author of the paper. Tessendorf notes that SNOWIE grew out of research that Idaho Power Co. had conducted with NCAR to improve its cloud-seeding program. This included the development of high-resolution computer modeling approaches to simulate cloud seeding, enabling researchers to better evaluate its impacts. Cloud seeding is a process by which silver iodide is released into the clouds, either from the air or via ground-based generators. In the case of the SNOWIE Project, the silver iodide was released by a second aircraft funded through Idaho Power Co., while the UW King Air took measurements to understand the impact of the silver iodide, French says. In all, the UW King Air made 24 research flights or intense observation periods (IOPs) lasting 4-6 hours each during SNOWIE. Of those IOPs, cloud seeding occurred during 21 of the flights. During the last three flights, Idaho Power had to suspend cloud seeding because there was so much snow in the mountains already, French says. While a good deal of research took place aboard the King Air, much of it also occurred on the ground. Numerical modeling of precipitation measurements was conducted using the supercomputer, nicknamed Cheyenne, at the NCAR-Wyoming Supercomputing Center. The numerical models simulated clouds and snow precipitation — created in natural storms and with cloud seeding — over the Payette Basin in Boise. The numerical models also allow researchers to study future storm events where measurements have not been obtained in the field. Throughout the western U.S. and other semiarid mountainous regions across the globe, water supplies are fed primarily through snowpack melt. Growing populations place higher demand on water, while warmer winters and earlier spring reduce water supplies. Water managers see cloud seeding as a potential way to increase winter snowfall. “Ultimately, water managers and state and federal agencies can make the decision whether cloud seeding is a viable option for them in terms of adding additional water to their supplies in addition to snowpack in the mountains,” French says. …despite decades of cloud seeding operations, proof that the technique works outside miniaturized clouds created in the lab has been elusive. One reason: Instruments of decades past couldn’t measure water droplet size in clouds in real time. Without knowing how a cloud evolves after seeding, scientists were unsure whether the silver iodide was doing anything at all. Another: The chaotic nature of weather makes controlled, natural experiments almost impossible. “Once you seed, you’re contaminating the cloud. You can’t repeat the experiment because you’ll never have the same atmospheric conditions again,” says Katja Friedrich, an atmospheric scientist at the University of Colorado in Boulder. At first, there was nothing. “The radar can only see [water] particles that are big enough, and these clouds had tiny droplets not detectable by radar,” Friedrich says. “Suddenly, we saw lines appear. It was really astonishing.” The zig-zagged lines matched the flight path of the first plane. Within these lines, the cloud’s water particles were getting bigger as they hit the silver iodide and froze. After a couple of hours, the snowflakes had grown from a few microns in diameter to 8 millimeters in diameter—heavy enough to fall to the ground, Friedrich and her colleagues report today in the Proceedings of the National Academy of Sciences. “We were super, super excited. Nobody had seen that before,” she says. 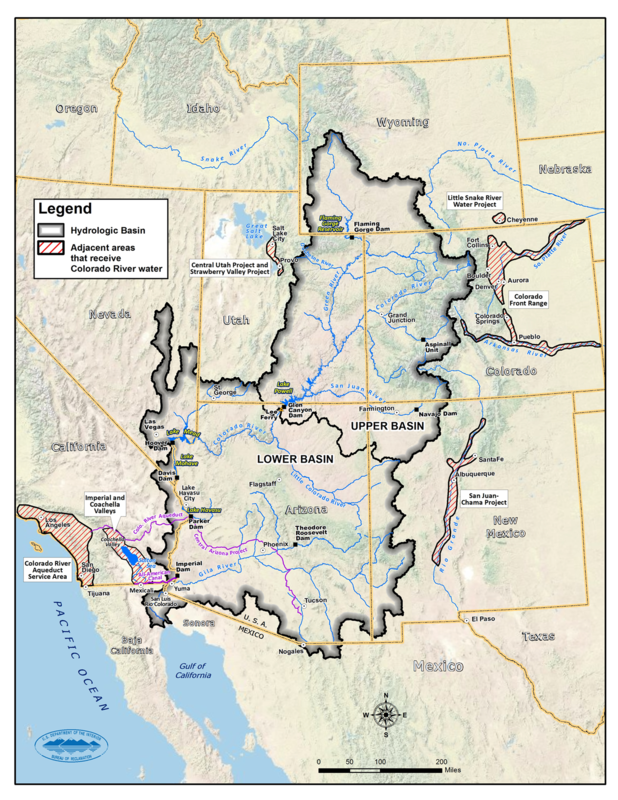 In much of the West, demand for water is projected to outpace supply, especially in the Colorado River basin, which provides drinking water to over 40 million people. There are various strategies to close the gap–some controversial like building new reservoirs and others more widely accepted like conservation. But what if you could just wave a magic wand and make it rain or snow? It’s not impossible and in fact, it’s been going on in the West for years. It’s called weather modification, better known as “cloud seeding.” With a changing climate and drier future, many are looking to the technique to boost snowpack in the mountains to meet growing water needs. More snow, even a small percentage can mean more runoff—and more water to cities and farms. Back in the fall we drove with Joe Busto from the Colorado Water Conservation Board out of Fraser, Colorado, in the Rocky Mountains to see a cloud seeding operation firsthand—and meet some of the people involved. Busto says they’re trying to “put extra snow in the bank where you need it for water supplies” and that cloud seeding has been shown to add anywhere from 5 to 15 percent to the snowpack. 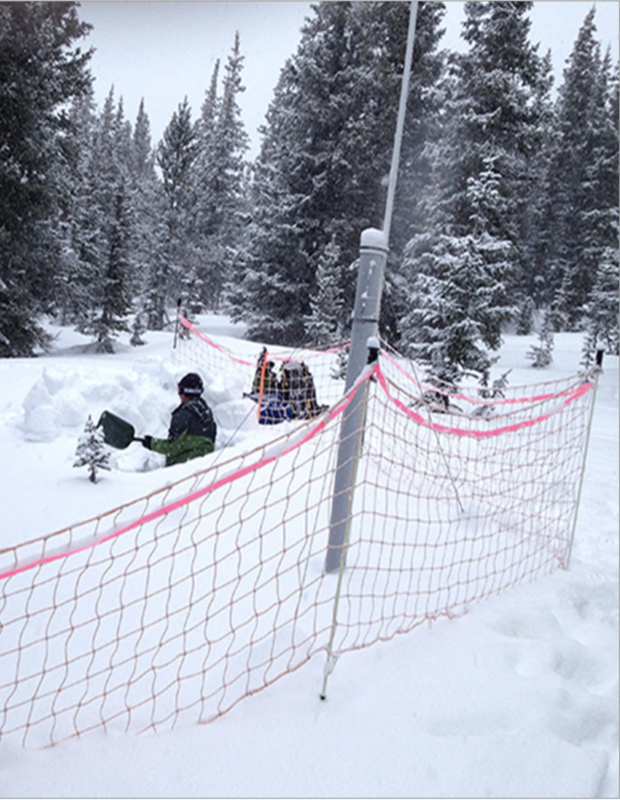 Snow pit at Winter Park — sampling for silver iodide. Photo via the Desert Research institute. There are about 40 total sponsors of cloud seeding in Colorado, including regional water districts, the state of Colorado, local water districts, cities, towns, counties, and nine of the state’s 28 ski areas. With us in the car is Maria Pastore, who represents some of those entities that range from Denver Water and Colorado Springs Utilities to ski areas like Winter Park, which we’re not too far from as we drive. For a state with much tension around moving water across the Continental Divide, Pastore says cloud seeding is being embraced by both sides. She says they have a large group of collaborative sponsors, and cloud seeding is probably one of the arguably least contentious programs for the West Slope and East Slope partners. Pastore’s group works with ski areas for cloud seeding because you get more bang for the buck. They’re already located in places that typically get a lot of snow—and they provide a recreational benefit. After folks have schussed or snowboarded across it, the snow will melt and flow into the tributaries of the Colorado River to become drinking water and to turn turbines in hydroelectric dams. We arrive at a spot that could pass for a nice campsite. Parked on it is a small camouflage-painted trailer with a twenty-foot mast sticking up in the air—and a barrel on top. Waiting for us by the trailer is Jeff Dean of the Desert Research Institute, or DRI. Dean and his team are at this site to get the cloud seeding equipment, called the generator, ready for the season ahead. So how does cloud seeding work? Dean explains that cloud seeding is done by adding extra dust to the air. A typical cloud will only drop maybe five percent of its available moisture. They’re not very efficient. Inside every cloud droplet and every snowflake there is a piece of dust—nuclei that started the process. In cloud seeding, they’re just introducing a little bit more of that dust. They do that by burning silver iodide, which goes up in the air to start the growth of a crystal that eventually will turn into a snowflake. DRI has meteorologists watching several factors like wind speed, humidity, and temperature to identify the perfect moment to fire up the generator to hit their intended target, which in this case is the Winter Park ski area and Denver Water’s drainage. Dean is out here with us to demonstrate how they start up the equipment. With a tap on his laptop the generator begins to hum. Dean could have been in his office in Reno or on a beach in Maui to activate the system. We watch inside the barrel and after a few seconds a bright yellow, robust flame appears, which indicates that the silver iodide solution is starting to burn. Dean says that last year this generator produced 22 inches of snow for the ski area. So how do they know it wouldn’t have snowed anyway? They assess that by looking for traces of the silver iodide in the snow. DRI did an analysis at the Winter Park ski area where they went halfway up the lifts and did a full profile all the way to the ground by inserting test tubes every ten centimeters. They then weighed the samples and did a chemical analysis. They found trace amounts of the silver, which according to the state of Colorado, are at extremely low concentrations and not harmful. The result was a partnership among the Southern Nevada Water Authority that serves Las Vegas, the Central Arizona Project, and six agencies in California including the mega-one in L.A. All now help fund cloud seeding in Colorado. So while recent storms are thrilling skiers, a good base on the slopes this year may also contain a silver lining for water users hundreds of miles away. [Larry] Hjermstad and his company, Western Weather Consultants, now run cloud seeding programs across the state, including in Summit County. Although there are currently no cloud seeding operations in the San Luis Valley, some folks believe this might be a good place for it. Joe Busto, who oversees weather modification permits for the Colorado Water Conservation Board, gave the Rio Grande Roundtable group a crash course on cloud seeding during its Tuesday meeting. The Valley-wide water group funds many water related projects in the Rio Grande Basin from ditch repair to reservoir rehab. The group was not asked for funding at this time. Busto said that another form of weather modification, hail cannons, previously operated in the San Luis Valley under a permit with Southern Colorado Farms, but the agricultural operation discontinued the practice. Cloud seeding occurs all around the region from Texas to North Dakota, Busto stated. Many of the cloud seeding operations in Colorado are associated with ski areas such as Vail, Crested Butte and Breckenridge, Busto explained. Others are connected to water districts. There are currently 110 machines in the state. He described the primary catalysts as either silver iodide, which is expensive but effective (and not harmful to the environment), or propane, which is cheaper. Before setting up a machine, plume dispersion tests are conducted to determine how the winds are blowing and from what direction so the cloud seeding operation can be set up to provide the most good. Operations are also the most effective when machines are set up at higher elevations, Busto explained. Roundtable member Charlie Spielman said he saw this as a solution to the imbalance between water supply and demand. “Cloud seeding is the best opportunity within our reach of making a real dent in that supply/demand gap,” he said. Busto said he believed a lean cloud seeding operation could be put in place for about $60,000 a year. He said he believed there could be many benefits to this area as well as downstream.